Daniel Houghtaling and I have decided to try to post an AAR. This is a short 4 turn scenario (Gettysburg 1.1.1 Opening Fight) used as a practice match so we can figure out the "how" of the AAR. How do we want to post it, how do we post it. 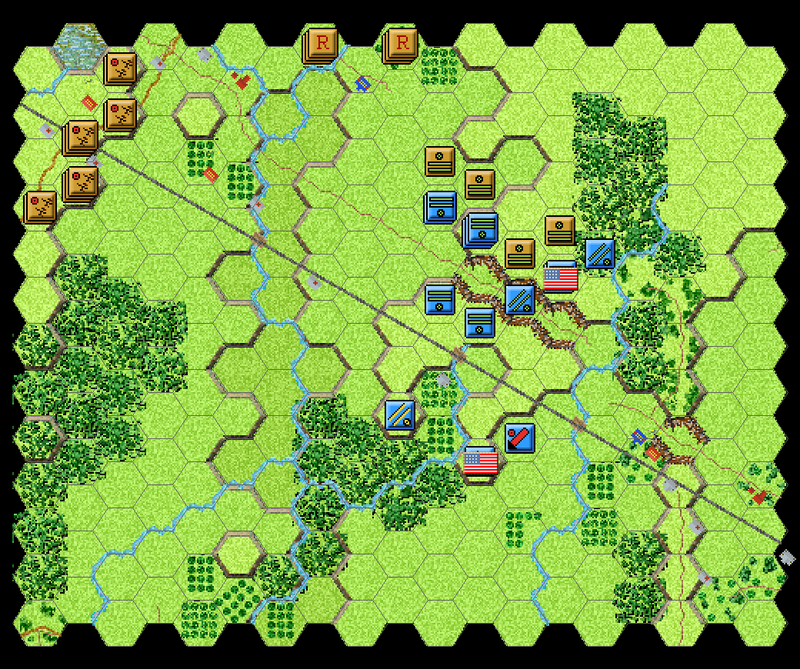 The plan is for Davis' Brigade on the left to aim initially for the railroad cut, while supporting Archer. Archer's Brigade is to take the first ridge that is currently defended by a lone Artillery Battery. After the first ridge is captured the Archer is to advance on the second ridge and hold. Meanwhile Davis is to advance to the north of the railroad cut guarding Archer's left. So the image didn't show up like I wanted it to. Anyone know the best way to post an image? Imgur is a little funky, but the below link should work. When you post again, if you are using a PC right click over the image on Imgur and select "Copy image address" or something along those lines. Then place it into the forum image tags here. The opening setup. Heth has 2 infantry brigades and 2 artillery battalions with 2 VP hexes as the objective. Union forces are unknown. Davis aims for the RR cut north of Chambersburg Pike. Brigade consists of the 55th NC (640 men), 2nd Miss (492 men), and the 42nd Miss (575 men). Primary goal is to support Archer's attack against McPherson Ridge in the vicinity of the Chambersburg Pike. Secondary goal is to advance north of the RR cut protecting Archer's left flank. Archer aims for where the Chambersburg Pike crosses McPherson Ridge. 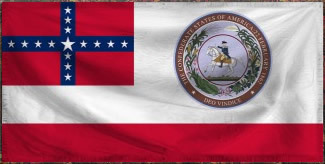 Brigade consists of the 7th Ten (249 men), 14th Ten (220 men), 5th Ala (135 men), 13th Ala (308 men), 1st Tenn (281 men). Primary goal is to capture McPherson Ridge in the vicinity of Chambersburg Pike. Secondary goal is to push to far side of McPherson Ridge and hold against possible counterattack. 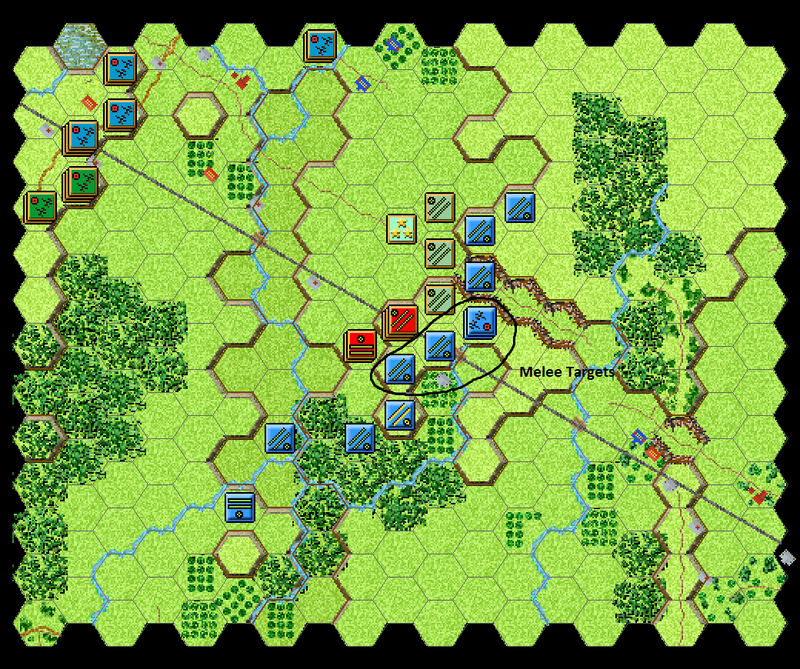 Both Davis and Archer advance with Pegram and McIntosh providing artillery support. 2 Union guns destroyed. 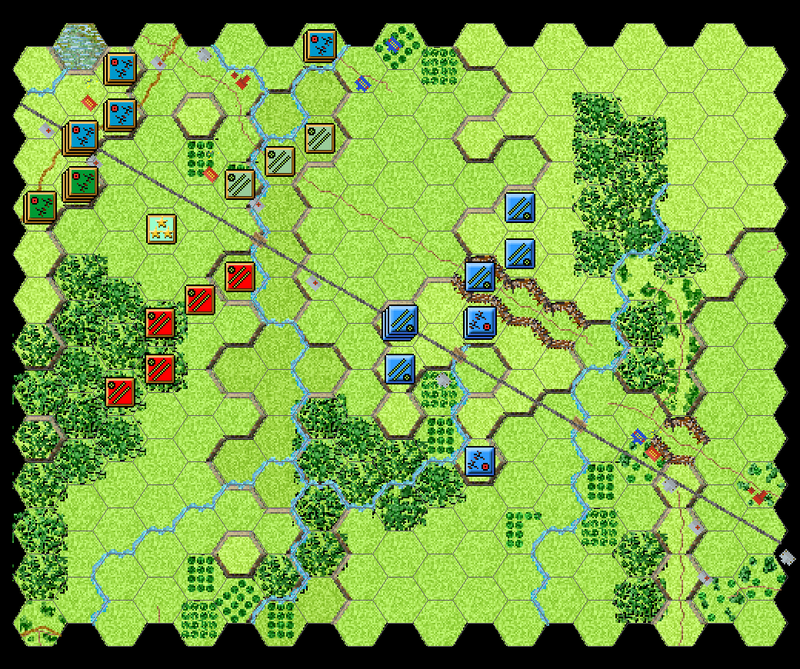 Union reinforces the near side of the ridge. 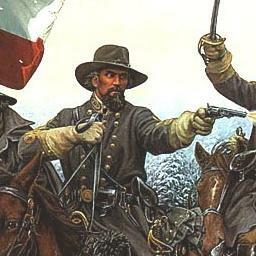 2 Regiments (500-700 men) south of the RR cut along with 8 guns. 3 Regiments (800-1100 men) in or north of the cut. I notice a LOS weakness with the placement of the Union arty battery just south of the RR cut. 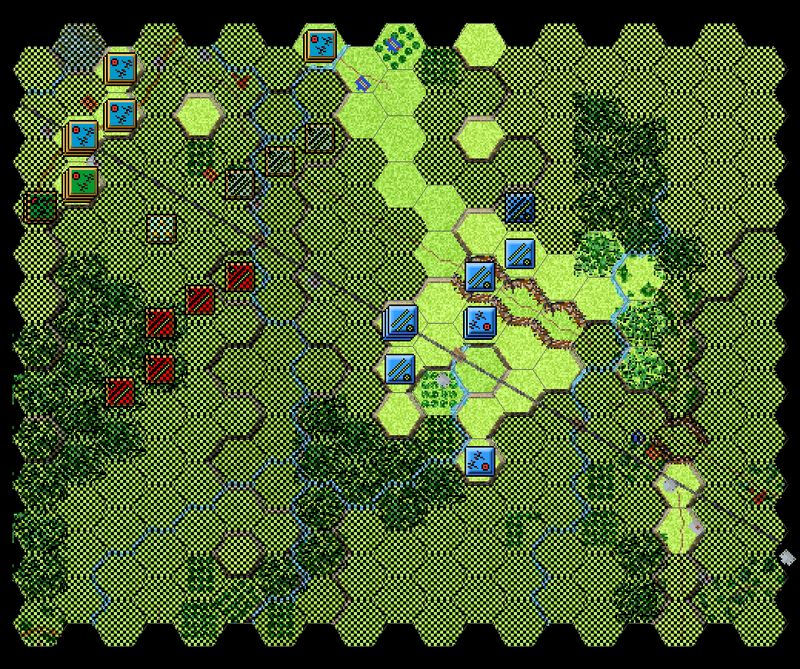 The arty cannot support the defense against Archer's Brigade. 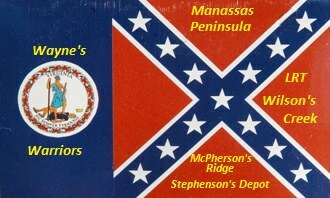 At the end of CSA movement 5 regiments have converged on the McPherson's Ridge where the Chambersburg Pike crosses. At the end of the melee phase the Union guns have been taken and the infantry support driven back. Nice to see you writing an AAR and pleased that you figured out the image posting. Good (or bad I guess) to see that your whupping me isn't a one-off but is your usual style. Well done. Nice AAR and good amount of screenshots. As some of you know this scenario and AAR was finished and complete but the end seems to have disappeared due to a bug or something wrong with the forum. I will see what I can do about reproducing the last couple turns of my AAR. Archer is to drive straight ahead towards the second ridge spur. Davis aims for the unsupported Arty battery and the ridge north of the RR cut. End of melee: The red melee was a success. Orange was a failure. 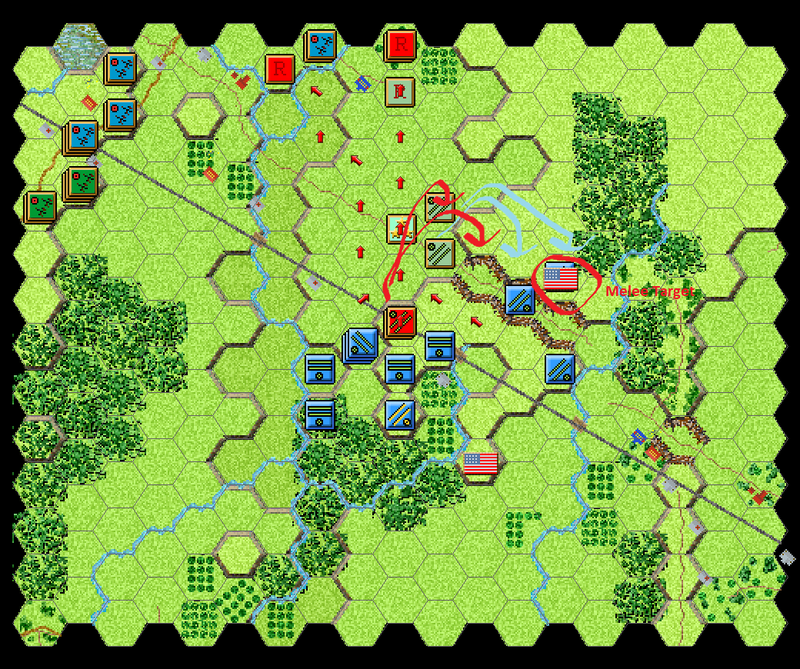 Yellow was foiled by melee defensive fire. Disaster strikes as union regiments crash into Archers right flank. 4 out of 8 regiments rout. Still there is a chance to capture an objective hex north of the RR cut. 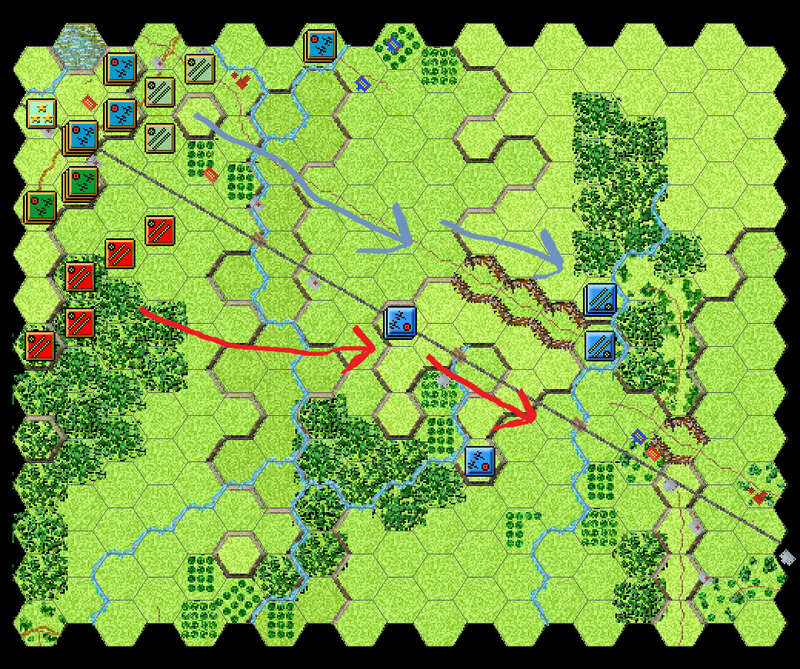 The movement goes smoothly but the melee attack against the Objective hex by Davis fails. 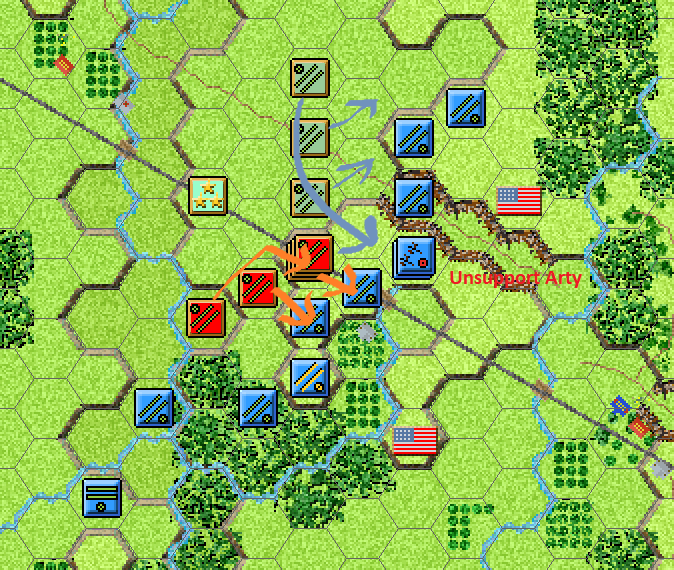 Union continues to counterattack and push back Archer's remaining regiments. Davis stands strong but risks being flanked on both sides as the scenario ends. In conclusion this was a surprisingly fun little scenario. Daniel is a great opponents, very fun to play against and chat with. I enjoyed learning how to post images and conduct an AAR. It was a bummer when part of it was lost due to a glitch. But I feel I reproduced it well enough. I hope it was enjoyed by others. Please feel free to comment. Thank you for this AAR, it's always a pleasure to follow a game. Happy New Year 2018 to all.